You've heard of swine flu. How about the swine that flew? 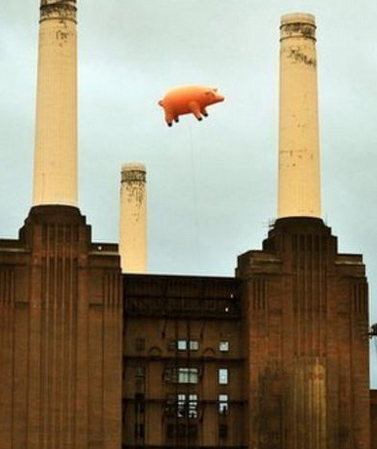 Algie, the inflatable pig that Pink Floyd commissioned so it could be photographed floating between the smokestacks of the Battersea Power Station for the cover of the Animals album, was about to be auctioned off but has been witdrawn from the lineup. Decommissioned in 1983, the plant served as a backdrop in the Beatles movie Help! and in the first Batman movie. More recently, it appeared on the big screen during the first Batman movie, The Dark Knight. The famous power station itself is being transformed into luxury apartments with a complex of retail stores at the street level. The pig along with other Rock related props created by artist Rob Harries was going to be sold to make room in his studio following a transition of his own from working on inflatables to sculpting with clay. Items that remain up for grabs include a giant, bronzed Babylonian woman used during a Rolling Stones tour and the enormous pig's head commissioned by Roger Waters for his Berlin Wall concert stage. Algie broke loose after the photo for the album cover was taken and briefly disrupted flights at Heathrow airport before being recovered from a field in Kent.